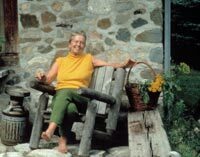 This video examines the lives and deaths of Maine authors Helen Nearing and her husband, Scott, who were best known for their book about homesteading practices called Living the Good Life. More than a biography, this hour-long documentary looks at the Nearings' commitment to self-sufficiency and voluntary simplicity and unveils the spiritual philosophy that underlay their lives and work. Producers Polly Bennell and Andrea Sarris spent five years collecting photographs, interviews and archival footage to create this moving and provocative portrait. "Offers tantalizing glimpses into the reality and mythology of Helen's life. Using photography, documents, and personal interviews, it draws the viewer into the world of the Nearings and what they sought to accomplish...A solid addition for school, college, and public libraries." "(An) informed biographical examination of the lives and deaths of homesteading authors Helen Nearing and Scott Nearing." "A very moving and uplifting account of a life led fully yet simply." Portrait of Alan Chadwick, inventor of the Biodynamic French Intensive Method of gardening.